Woke up to a breeze blowing down my sleeping bag, brrrr! Sometime in the night the breeze shifted from a westerly to an easterly. Now the breeze is almost blowing into my front door. It's still dark but light enough to eat. I get up, get dressed, and put my sleeping stuff away. I eat in my tent. No mocha this morning due to wanting to get moving and the significant dust that would be blown around and into my tent be cooking. I'm out and moving before six. The trail continues to follow the Hat Creek Rim. In fact it will most of the day. There is currently a cool breeze blowing. I don't think it'll get too hot. I hope not I only have two liters of water. The trail requires my full attention. I would love to look at the view but every time I look up I kick a rock embedded in the trail that is sticking up just enough for me the trip over it. This is so painful and causes me to have to lunge forward to catch myself. It is exhausting! I hate bumping into rocks. So I stare at the trail. Mile after mile. I hear something like a cow bell off to my right. Not a cow bell, a doorbell? No, what is that? I look up and over there to my right, stopping first to save my toes. A guy camping? In his beautiful blue BMW convertible? On this dusty road? Who does that? He’s looking at me, “Do you want some trail magic?” Huh? I dumbly stare. Uh, a trail angel out here? In the middle of nowhere? Asking me if I want trail magic. I am stunned, overwhelmed, wow, just for me? “Yeah, sure,” I say. I walk up the road. He's not camping he's setup for dispensing breakfast. I am moved, grace has found me. Not that I deserve it or have done anything to earn it. Sunday morning and I am being served by a ‘ministering spirit’ which is what the word ‘angel’ means. So cool, so very very cool. The trail angel’s name is Fancy Pants. He makes me a cup of amazing coffee using his aeropress. Then he makes me bacon and eggs. All the while I'm sitting in his camp chair enjoying the morning, the amazing view of Mt Lassen, the breeze, the sunshine. Here he is demonstrating the love of God to me in a real flesh and blood way. This is better than any sermon. This is real life, in your face, grace. I don't know if he is a believer, and frankly it's irrelevant. Somewhere in his past, specifically last year hiking the PCT he experienced grace. Trail Magic is the term that Thru-hikers use because it seems safer than the Christian term Grace. But there is nothing magic about it. It is an act of will based on inspiration. A willful spirit within. Fancy Pants takes time away from his everyday city life, drives hundreds of miles in his beautiful car, on to a dirt road, and makes breakfast for complete strangers. Grace begets Grace. When your life is affected by grace it creates something within, inspiration. He was truly inspired, passionate with excitement about what he was doing. Christian or not, there are many Christians who could benefit from experiencing the grace of Fancy Pants. Thank you my friend, you have provided me one of the best church services I've ever been to on this Sunday morning. The cool thing is that he is a trail friend of puff-puff who’s blog I followed as she walked the PCT. He told me she's walking the PCT again this year, only southbound. So perhaps we’ll meet in passing somewhere. After church I head back to the trail and begin walking north again. Wow! What a cool time. I walk on and on thinking happy inspirational thoughts some of which I've tried to capture here. The day moves on and I pass through different parts of this hot dry section. I pass the Cache 22 water cache, leaving a small donation, 'grace begets grace' was my thought. Thank you trail angel who brings water and stuff to Cache 22. The day gets hotter and the trail moves off the ridge. Or better said, the ridge melts into the ground and I pass through an ancient lava field. The black broken rocks still seem to cover cracks that go who knows how deep. I always feel like these volcanic places look like places where orcs could suddenly appear from some dark hidden recess and drag you into their underworld. 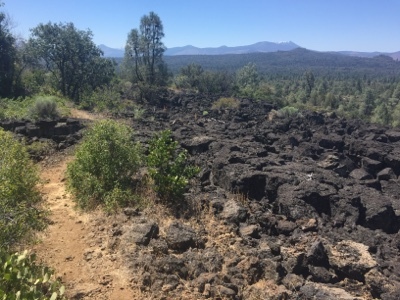 It's virtually impossible to cross the lava without a trail. It would be so slow and tiring. Once across the lava I begin heading more west than north, at least it feels that way. The terrain takes on a character very similar to the terrain around the town I live in. A grassy, rocky trail through oak trees. The smells are the same, the air temperature is the same. I find it easy walking only because it seems so familiar. The stones in the trail are still my biggest problem. Even as I stare at the trail I somehow still miss seeing some of the rocks. Every once in a while I trip. I turn and look, sure enough there's a rock I somehow didn't see. I find this extremely vexing. Maybe I'm daydreaming and not paying attention to to the rocks, every time a kick and a trip is my reminder to PAY ATTENTION! I reach the small creek that ends the dry section. I use my microfilter to produce a bottle of clean cold water which I drink in its entirety right on the spot. I love carrying my microfilter, it's been a game changer for me. I continue on to the fish hatchery and power plant at Lake Baum. A delightfully green place of water and sounds of water. The contrast from the previous thirty miles is stark and refreshing. Water everywhere. People fishing, people kayaking. The lake is filled with all kinds of water fowl. It seems so clean and inviting in spite of the floating mats of water plants. I collect enough water for dinner, breakfast, and a liter to get me to Burney Falls State Park in the morning. It's only about ten miles from here. I continue hiking to a spot on the map called CS1406. Some campsites on the side of the lake far from the rest of the people places. The only access to them is from the PCT. Special campsites for PCT hikers! For me! No one else is here. Just me, my own personal campsite with my own personal access to Lake Baum. I set up my tent on a flat spot and then head down to the lake with my pack towel and dirty socks. No ones around just me. My arm of the lake. I strip down to my under shorts and jump into the lake. Wow! It's cool and refreshing! So refreshing. Invigorating. I dunk my head under and scrub my head. Then I rinse my pack towel, my socks, and my unzipped pant legs. Removing the dust and grime from each. This is so amazing. I dress and head back to camp feeling clean and refreshed. I make dinner. Mama Mia’s Italian Soup, with added ramen noodles and sausage. For dessert I have a peanut butter tortilla. I eat dessert first, because I can. After dinner and my chores I climb into my tent and escape the flies and mosquitos that are doing their best to ruin this most delightful and grace filled day.